What makes a good fit between a patient and their dental office? How you go about selecting a new office will depend a lot on what you expect from your dentist. Here are just a few reasons why we believe we could be the best choice for you and your family. 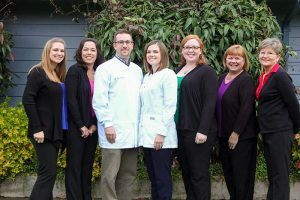 Fisher Distinctive Dentistry provides comprehensive dental treatment to people of all ages. Our patients have commented that they have never had as complete an examination as they have gotten in our office. We take the time to gather your information and talk with you about your dental and medical history so that we know where you’ve been and where you would like to go and how you would like to get there. While we believe it’s our responsibility to inform you of our findings, answer your questions and provide you with information and written treatment options – it’s your right to decide what works best for you. Both of our doctors are kind and empathetic and will help you with this process without being pushy. All of our sterilization equipment is monitored and tested weekly by an independent laboratory and we provide every team member with initial and annual bio-hazard sterilization and safety training, CPR and First Aid. Our digital x-rays take images that are of better diagnostic quality but with up to 90% less exposure to radiation! All of our treatment rooms are private so you can talk with your dentist and receive your dental treatment without the person in the next chair hearing everything! Your health care information is safe with us. Dr. Devin Fisher joined her father’s practice in 2008, bringing with her strong commitment to provide the most up to date technology for her patients in a clean, comfortable, stress-free environment. Dr. Devin is patient and kind and those fearful or new to dentistry seem to like her instantly. Originally from Yakima, Dr. Zack Bergevin joined his wife Devin in the family dental practice in 2010. In addition to providing comfortable general and restorative dentistry for his patients, Dr. Zack has completed over 400 hours of continuing education focused specifically on traditional braces and Invisalign clear aligner therapy. Dr. Zack is someone you can really talk with and he has a great sense of humor. Our office is open 5 days a week with expanded hours Tuesday and Wednesday evenings; these appointment times are very popular and must be scheduled well in advance. We also block time in our schedule each day for dental emergencies so that if you need us chances are good we can work you into our schedule. We choose to use only the best performing materials for the restorations we make for our patients. While amalgam metal restorations are still commonly placed in most dental offices, we have chosen to go metal-free and use only bonded resin or porcelain materials when we remove decay or replace old fillings. 99% of our veneers, crowns and bridges are also metal-free and custom, hand-crafted by master artisans, not mass produced or made in foreign countries. The result is greater quality control, personalization and better, long-lasting results for our patients. We are proud to accept CareCredit, making your dental treatments affordable. On approval of credit we offer a wide range of payment plans, from six months interest-free to monthly budget plans and seniors, 65+ receive a 5% discount on all services. We are premier providers with WDS and Delta Dental and participate in the CIGNA Health Savings Plan, we can also electronically process most other insurance claims so just leave the paperwork to us. We support our veterans and participate in the VA’s Oral Care Rehabilitation Programs. Although there are a number of options to treat and restore missing teeth, none have proven to be as functionally effective and durable as implants. Implants can be used to replace a single tooth, several teeth, or to support a complete denture. Both of our dentists have undergone postgraduate training and have extensive experience in dental implantology; they are also current members of the their local Dental Implant Study group. We can design and mill most single posterior porcelain crowns in our office using CEREC computer generated crown technology. Everything can be done in one visit! While your visit may be slightly longer than that of a traditional crown, there is no need to wear a temporary crown or come back for a second appointment to seat the permanent crown. Our office has done numerous smile makeovers from the routine use of veneers and Zoom! whitening to more complex cases needing a combination of veneers, orthodontics, crowns and implants.